I want to believe that all of my students share my enthusiasm for learning. I want to believe that all of my students understand the importance of citing their sources. I hope they realize that what they learned from the research process is far more important to me than what the quoted words of their authoritative sources. While I do have Pollyanna tendencies, I am ultimately a realist. Sometimes teachers are so focused on the end product that we don't allow time to focus on proper note taking or paraphrasing. Sometimes students don't feel the passion, think about the ethics, or realize the full consequences of their actions. Sometimes they just want to finish the project so they can move on to the next item on their list. A teacher may notice a disconnect between the writing on the page/screen and the student who turned in the work. It could be the result of a new writing style, liberal use of a thesaurus, poor note taking, or even an over zealous parent editor. Or, the content could have simply been lifted directly from the source and dropped into the student's report. 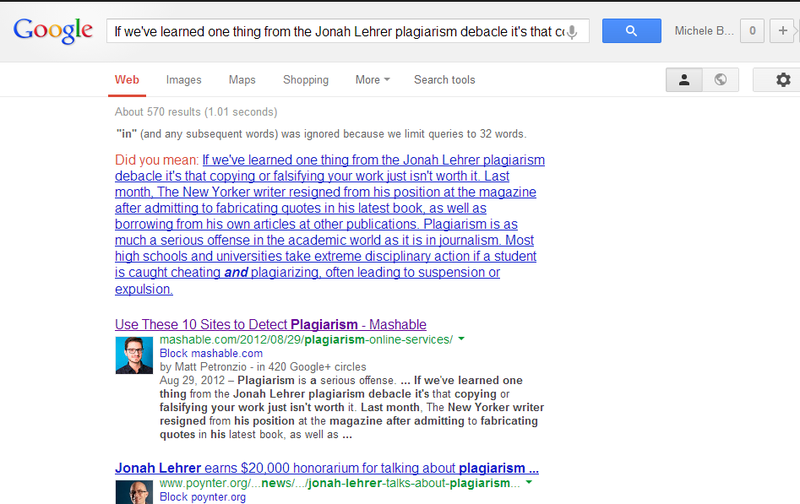 Google is the easiest to use and most accessible of the free plagiarism checkers. Simply copy and paste the questionable material into the search box and review the results. Words from the search box are bolded in the search results to facilitate scanning (click image at left to see a larger view of the results). When large blocks of bold text are visible in the results page, it is a clear sign that something is amiss. This method will detect plagiarized text from Wikipedia, arguably the most plagiarized web site among students of all ages. 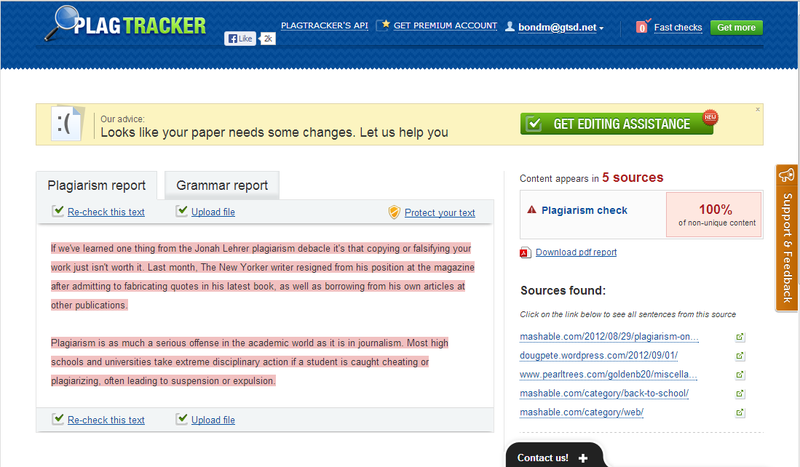 The freemium PlagTracker compares student work against a bank of academic papers and the accessible web. Type or paste the questionable text into the box, click the button to "Check for Plagiarism," and moments later see a report listing how much of the content appears to be original. After the initial check users must create a free account and wait up to 30 minutes for results. The report is helpful in that it provides a direct link to possible sources for verification. Click the image at right to see a larger results view. For each of these examples, I used a paragraph from a post at Mashable titled "Use These 10 Sites to Detect Plagiarism."